Those pics take me back a few years. That milker is what Granddad used when he was milking 5 cows. I remember as a kid when the first dairy in the area went to milking machines and dad took us there for a day to see the KNEW deal. Those were exactly the milkers they used, that was in the 50s. Don;t recall when in the 50's though. That is the type that my husband's family used when they stopped hand milking at the dairy. chippie wrote: That is the type that my husband's family used when they stopped hand milking at the dairy. I think they were probably the first ones to come along. Unless a parlor was built from scratch nobody had vacuum lines or the money to put them in when hand milking went away. I found this to be pretty interesting! I luv herfrds wrote: My only complaint with this set up of mine is when she gets the urge to poop or pee the belt slides off her back and the cups lose suction. She pooped once and before I could grab the belt the cups lost suction and the hind cups dropped into the poop and the suction started again and I just heard that sloop and I just stood there cussing! Dumped the milk that day. I know a lady that has a milk bucket for sale. It is one that stands on the floor and has the clear tubes coming off the cups. I can find out what she wants for it. It does not come with the vaccum pump. 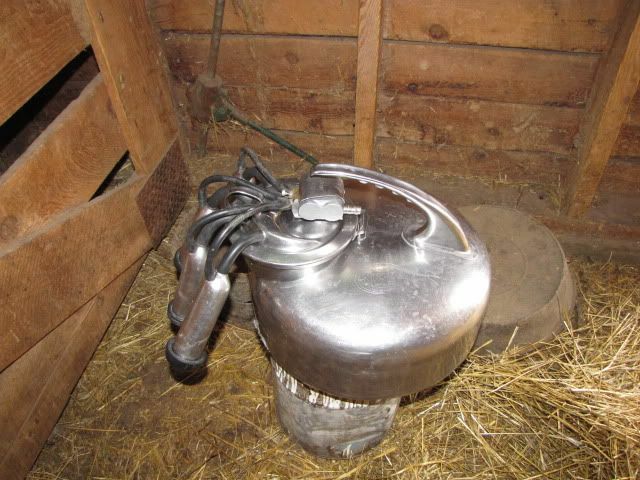 Used to milk test at a farm that used a surge milker like in the pictures, for their fresh and treated cows. It was a stanchion barn and it was easier to use the pail. They always put the strap over the back and a bit forward of center on the cows, never saw it moved behind the hips. They milked over 100, bringing the cows in 20 at a time on each side and always had one or two in the bucket. cows never raised a fuss and it couldn't fall off when it was across their back well in front of the hips. I have a delval setup. Bought at garage sale $85 never used it but had pump vacuum gauge bucket and lid and claw. Woman had it and had quit milking goats.